When the current political reality is so unsatisfactory, it seems only reasonable to try something else. We borrowed the gent in the cape from Rebels Market, an online “Counterculture Megastore.” While goth and steampunk aren’t exactly our style, we were quite taken with this black brocade coat. The nondescript building of Frame 2 is really a Navy Department Office in 1918 or 1919. 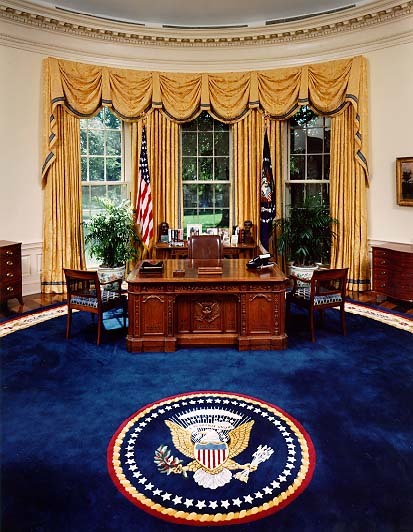 The photo of the Oval Office is from the Clinton Administration. The staffer in the black suit is from pixabay.com, shared under a Creative Commons license. The photo of Mr. Trump is from the U.S. embassy in Uruguay. The forest trees wallpaper behind Mr. Trump’s photo is by elias_noessing, shared under a Creative Commons license. The hand holding Donny & Ahmed is from clker.com, shared under a Creative Commons license. Finally, inspiration for this cartoon’s concept came from the work of Ben Katchor. Seek out his comic-strips – you won’t be disappointed! Categories: current events | Tags: cartoons, Donald Trump, fiction, immigration, Iran Nuclear Deal | Permalink.